Das Hotel liegt im Eliot Nachbarschaft, ist dieses klassische Queen Ann viktorianischen Duplex hat mit modernem Interieur aktualisiert. Nur 2 Blocks zu Fuß zu Cafés, Restaurants und Musikveranstaltungen. Das Haus verfügt über Bambusparkett, Granit Küchenarbeitsplatten, 9-Meter hohen Decken, Innenzehn leichte Türen und eine Klaue Fuß Badewanne im Badezimmer. King-Size-Bett im Schlafzimmer und Queen-Size-Klappcouch im Wohnzimmer. Originalvorlage im gesamten Gebäude. Es ist eine private Terrasse mit einem ummauerten / eingezäunten Bio-Garten. Neuere Geräte sind rostfreier Gas 6-Flammen-Herd, Kühlschrank mit Eismaschine, 27 'Flachbild-TV, Waschmaschine und Trockner und neue Gasofen. Gute Qualität Bettwäsche und Handtücher, alle Küchengeräte, Geschirr, Besteck, Gläser und Besteck. Qualitätskochgeschirr. Inklusive privaten Wasch- und Lagerraum oder Arbeitsbereich im Keller. Große Zugang: Eliot Nachbarschaft ursprünglich als eigenständige Stadt von Albina in den späten 1800er Jahren gebaut wurde. Es ist eines der ältesten Stadtteile in Portland. Die Arbeiter, die mit der Fähre über den Fluss zu nehmen in der Stadt Portland zu arbeiten. Viele dazu beigetragen, den Deich zu bauen. Nun ist Eliot einer der engsten "inneren" Nachbarschaften in der Stadt. Dieser große Wandern und Radfahren Nachbarschaft. (Es gibt einen Fahrradverleih 2 Blocks entfernt), und es ist die Heimat von großen Restaurants und Cafés & Veranstaltungsstätten. Die Blöcke aus Autobahnanschluss und der Innenstadt. 2 Blocks von Buslinien, 10 Blocks zu MAX Stadtbahn. Der Umzug in Portland? : Dieses Haus ist als Kurzzeitmiete zur Verfügung. Skifahren, Snowboarden, Wandern, Wasserski, Windsurfen, Segeln Internat, Radfahren & Mountainbiken. Portland ist von Parks umgeben und verfügt über die größte Innenstadtpark in den Vereinigten Staaten. Washington Park ist nur 10 Autominuten. Mt. Tabor ist der einzige Innenstadt Vulkan in den USA, nur 15 Minuten mit dem Auto. Nur 1-2 Stunden in jede Richtung, und Sie finden sich an der Küste, auf dem Berg oder in der Columbia Gorge National Scenic Area finden. Sichtbare Berge gehören Mt. Hood, Mt. St. Helens und Mt. Adams. Marihuana legal ist in Oregon. Es gibt einen Laden um die Ecke auf MLK Blvd. Klaue Fuß Badewanne mit großen regen Duschkopf. Kompaktes Stereo-System mit iPod-Dock und CD / MP3-Player Gasherd mit 6 Flammen. Mitte Brenner verfügt über optionale Lang Ring Grillplatte. Hammock - robuste Haken auf der Rückseite Deck Dishman Community Center verfügt über einen Swimmingpool und ein Fitnesscenter. Das Hotel liegt 3 Blocks entfernt, zu Fuß zu erreichen. Very hypoallergenic, which is important for us. Thoughtful. Nice towels. Nice coffee. all you need. Close to Hwy 99. Not much of a noise problem but when big trucks go by the house shakes. Great restaurants nearby. We had steak at Ox and Ethiopian at Queen of Sheba. Transit a block away. A wonderfully clean and comfortable home in a great location for the convention center - not to close and not too far. A nice 10-15 minute walk to start and end your day. Thank you Scott. You were an absolute pleasure! We appreciate your friendly communication and kindness. Thanks for mentioning the easy/close walk to the convention center. My husband and I have been staying in VRBO properties for over ten years both in the states and abroad. This property is the best one to date. It is clean, spacious, comfortable, very well equipped and in a great location (if you like neighborhoods.) Julie and Rocio were extremely attentive and flexible re: check-in/check-out times. This was our first trip to Portland. Beforehand I asked Julie for "to do" recommendations for both the city and its environs. She was incredibly gracious in responding quickly and extensively. Our visit was limited to only 5 days. We followed several of Julie's recommendations which included dining experiences, hiking and a trip to the coast. We were not disappointed. Our only regret is that we did not have enough time to do more! I highly recommend this rental. Thank you for this outstanding review! We're thrilled to know you enjoyed the rental and your visit. We're always happy to share ideas about the many great things Portland and the surrounding area has to offer. Charming little house, completely remodeled I interior. We travelled to Portland for meetings at the convention center & managed to find this little gem of a house for our stay. Initially we were slightly disappointed when we caught first sight of the house. The house itself is as pictured, but the neighborhood and adjacent buildings look a bit ragged (it’s a bit in need of revitalization), but as soon as we got inside we fell in love with this little place. The kitchen is very well stocked , bathroom is much larger than expected for a home this size—loved the claw foot tub—The leather pull out sofa wasn’t very comfortable for sitting, but no worries—the weather was beautiful & we spent all our time outside on the back deck overlooking our private tiny garden. The only suggestion we could offer our host would be to spend a bit of time tending the garden since it’s showing neglect—overall, we loved our HomeAway experience & will definitely do this again. Thanks for your detailed review. We're glad you enjoyed your stay, and hope to see you again one day. I appreciate you mentioning the garden. We've had a very hot Summer in Portland this year and last year. We're trying to figure out the best way to manage the plants during unseasonably hot days. 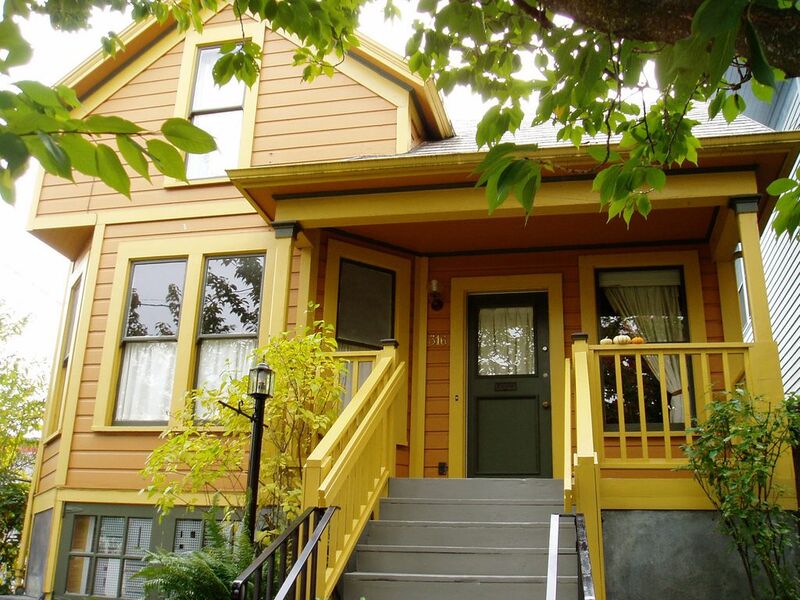 This very nice, clean & spacious apartment is just a short walk from your choice of Portland's amazing public transportation (streetcar, metro, buses). There also are a number of great restaurants & brew pubs just blocks away: we recommend Izakaya Kinchinto, Pine State Biscuits, Ex Novo--there are more!) We were worried about the heat wave happening during our stay but there is an air conditioner in the bedroom. Enjoy. Thanks for mentioning the super convenient public transportation. The apartment is in a great location to take off in any direction. Glad you had the chance to enjoy some of the neighborhood's great food! We loved the back patio, nice kitchen space, hardwood floors, comfortable bed, and air conditioning in the bedroom. Was very clean and comfortable. Would definitely stay here again. Thanks for sharing your comments. We're pleased you enjoyed the apartment! Hope to see you again. Eliot Nachbarschaft. Städtische Umgebung, 2 Blocks von Top-Restaurants, Cafés, Einzelhandel und Musik Veranstaltungsort. Minuten zur Innenstadt, Waterfront, Pearl District, Rose Quarter & Convention Center. Eliot Neighborhood Website Zitat: "Ich bin an unserem zentralen Standort verkauft ... wir haben so einfachen Zugang zu den Autobahnen, 2 Max Lines und viele Buslinien zur Auswahl. Ganz zu schweigen von dem Fahrradkorridor in Williams und Vancouver und auch eines Tages in Eliot für Street Car! Ich verliebe mich jedes Jahr mehr in unsere Nachbarschaft.